The eyelids act to protect the anterior surface of the globe from local injury. Additionally, they aid in regulation of light reaching the eye; in tear film maintenance, by distributing the protective and optically important tear film over the cornea during blinking; and in tear flow, by their pumping action on the conjunctival sac and lacrimal sac. Structures that must be considered in a description of lid anatomy are the skin and subcutaneous tissue; the orbicularis oculi muscle (shown below); the submuscular areolar tissue; the fibrous layer, consisting of the tarsi and the orbital septum; the lid retractors of the upper and lower eyelids; the retroseptal fat pads; and the conjunctiva. Orbicularis oculi muscle anatomy. (A) Frontalis, (B) corrugator superciliaris, (C) procerus, (D) orbital orbicularis, (E) preseptal orbicularis, (F) pretarsal orbicularis. 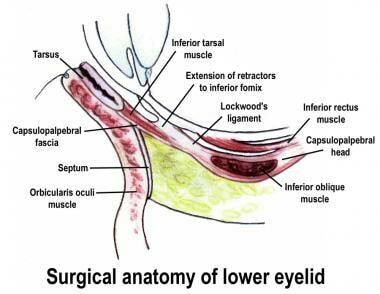 In eyelid reconstruction, it is more practical to consider the repair of the anterior and posterior lamellae, with the anterior lamella being the skin and orbicularis, and the posterior lamella being the tarsus and conjunctiva. The upper eyelid skin crease (superior palpebral sulcus) is approximately 8-11 mm superior to the eyelid margin and is formed by the attachment of the superficial insertion of levator aponeurotic fibers (8-9 mm in men and 9-11 mm in women). The inferior eyelid fold (inferior palpebral sulcus), which is seen more frequently in children, runs from 3 mm inferior to the medial lower lid margin to 5 mm inferior to the lateral lid margin. The nasojugal fold runs inferiorly and laterally from the inner canthal region along the depression of separation of the orbicularis oculi and the levator labii superioris, forming the tear trough. The malar fold runs inferiorly and medially from the outer canthus toward the inferior aspect of the nasojugal fold. The open eye presents the palpebral fissure, a fusiform space between the lid margins that is 28-30 mm in length and about 9 mm in maximal height. The natural curvature of the upper lid is a function of the static shape of the tarsus combined with adaptation of the lid to the curvature of the globe. The palpebral fissure presents the lateral canthus (an angle of 30-40° approximately 5 mm from the lateral orbital rim), the medial canthus (forming the medial angle of the fissure, with the upper border passing inferomedially and the lower border passing horizontally), and the lacrimal papillae, which rest on the free lid margin, with the punctum lacrimale serving as an opening to the canaliculus. The skin of the eyelids is the thinnest of the body (< 1 mm). The nasal portion of the eyelid skin has finer hairs and more sebaceous glands than the temporal aspect, making this skin smoother and oilier. The transition from this thin eyelid skin to the thicker skin of the eyebrow (approximately 10 mm below the lower eyebrow hairs) and the cheek skin (below the nasojugal and malar folds) is clinically evident. These boundaries should be considered in reconstructive eyelid surgery. The subcutaneous tissue consists of loose connective tissue. Fat is very sparse in preseptal and preorbital skin and is absent from pretarsal skin. Subcutaneous tissue is absent over the medial and lateral palpebral ligaments, where the skin adheres to the underlying fibrous tissue. Dermatochalasis, blepharochalasis, and epicanthic folds all are conditions that primarily involve the skin and subcutaneous tissue of the eyelids. The orbicularis oculi muscle is one of the superficial muscles of facial expression. Invested by the superficial musculoaponeurotic system (SMAS), muscle contracture is translated into movement of the overlying tissues by the fibrous septa extending from the SMAS into the dermis. The muscle may be arbitrarily divided into the orbital and palpebral parts, with the latter being divided further into the preseptal and pretarsal portions. The palpebral portion is used in blinking and voluntary winking, while the orbital portion is used in forced closure. Facial nerve innervation is from the temporal branches and from zygomatic branches of the facial nerve. The nerves are orientated horizontally and innervate the muscle from the undersurface. The orbital portion extends in a wide, circular fashion around the orbit, interdigitating with other muscles of facial expression. It has a curved origin from the medial orbital margin, being attached to the superomedial orbital margin, maxillary process of the frontal bone, medial palpebral ligament, frontal process of the maxilla, and inferomedial orbital margin. Fibers from this medial origin sweep around the orbital margin in a horseshoe fashion. The muscle fibers extend superiorly to intermix with the frontalis muscle and corrugator supercilii muscle, laterally to cover the anterior temporalis fascia, and inferiorly to cover the origins of the lip elevators. The preseptal orbicularis muscles overlie the orbital septum and take origin medially from a superficial and deep head associated with the medial palpebral ligament. The fibers from the upper and lower lid join laterally to form the lateral palpebral raphe, which is attached to the overlying skin. The pretarsal portion lies anterior to the tarsus, with a superficial and deep head of origin intimately associated with the medial palpebral ligament. Fibers run horizontally and laterally to run deep to the lateral palpebral raphe, to insert in the lateral orbital tubercle through the intermediary of the lateral canthal tendon (LCT). Submuscular areolar tissue consists of variable, loose connective tissue below the orbicularis oculi muscle. The lid may be split into anterior and posterior portions through this potential plane, which is reached by division at the gray line of the lid margin. In the upper lid, this plane is traversed by fibers of the levator aponeurosis, some of which pass through the orbicularis to attach to the skin to form the lid crease. In the lower eyelid, this plane is traversed by fibers of the orbitomalar ligament. Superior continuance in this submuscular plane arrives at the retro-orbicularis oculi fat (ROOF), which is best developed in the eyebrow region. Additionally, the suborbicularis oculi fat (SOOF) is found in the lower lid in a continuance of this plane. The tarsal plates are composed of dense fibrous tissue and are responsible for the structural integrity of the lids. Each tarsus is approximately 29 mm long and 1 mm thick. The crescentic superior tarsus is 10 mm in vertical height centrally, narrowing medially and laterally. The lower border of the superior tarsus forms the posterior lid margin. The rectangular inferior tarsus is 3.5-5 mm high at the eyelid center. The posterior surfaces of the tarsi adhere to conjunctivae. Each tarsus encloses about 25 sebaceous meibomian glands, which span the vertical height of the tarsus. Their ducts open at the lid margin posterior to the grey line and just anterior to the mucocutaneous junction. The medial and lateral ends of the tarsi are attached to the orbital rims by the medial and lateral palpebral ligaments. The medial palpebral ligament (medial canthal tendon [MCT]) is a fibrous band stabilizing the medial tarsi and is intricately related with the orbicularis oculi muscle and the lacrimal system. The superficial head of the pretarsal orbicularis muscle lies anterior to the canaliculi and forms the anterior limb of the MCT. This head is primarily horizontal but also has a superior supporting extension inserting onto the frontal bone. 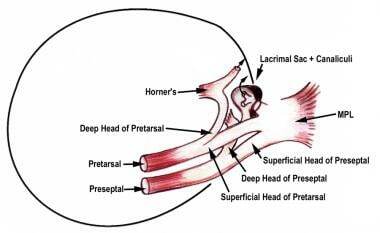 The deep head of the pretarsal orbicularis muscle (also constituting the Horner muscle) inserts into the posterior lacrimal crest and onto the fascia of the lacrimal sac. Superiorly, the LCT is contiguous with the lateral horn of the levator aponeurosis, while the inferior edge is well defined and arcs inferiorly to its insertion. About 2 mm of lateral movement of the lateral canthal angle occurs during abduction, presumably caused by posterior fibrous attachments to the lateral check ligament of the lateral rectus muscle. Flowers et al described a lateral tarsal strap, distinct from the lateral canthal tendon, as a broad and strong structure connecting the lower lid tarsal plate to the inferolateral orbital rim. The tarsal strap attaches 3 mm inferiorly and 1 mm deep to the lateral canthal tendon, approximately 4-5 mm deep to the anterior orbital rim. Upon surgical release of the tarsal strap, the lateral canthus is elevated easily. The orbital septum is a connective tissue structure that attaches peripherally at the periosteum of the orbital margin (the arcus marginalis); it centrally fuses with the lid retractor structures near the lid margins, thus acting as a diaphragm (that has been reported to retain orbital contents). Although usually depicted diagrammatically as a discrete layer immediately posterior to the orbicularis oculi muscle, the orbital septum is a multilaminated structure that is part of the anterior orbital connective tissue framework. The septum has a laxity consistent with the mobility of the eyelids. Laterally, the septum is attached to the orbital margin, 1.5 mm in front of the lateral orbital tubercle attachment of the lateral palpebral ligament. The Eisler fat pocket separates the lateral palpebral ligament from the orbital septum. From there, the septum continues along the superior orbital rim at the arcus marginalis. Superomedially, the septum bridges the supraorbital groove, passes inferomedially anterior to the trochlea, and then follows the posterior lacrimal crest. As it runs down the posterior lacrimal crest, it lies anterior to the medial check ligament and posterior to the Horner muscle (and hence, behind the lacrimal sac). 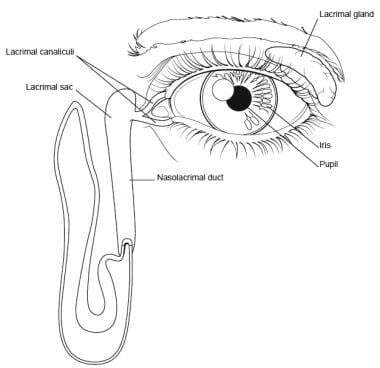 The line of attachment crosses the lacrimal sac fascia to reach the anterior lacrimal crest at the level of the lacrimal tubercle. From there, it passes inferiorly down the anterior lacrimal crest and laterally along the inferior orbital rim. A few millimeters lateral to the zygomaticomaxillary suture, the attachment leaves the rim and lies several millimeters from it on the facial aspect of the zygomatic bone, thus forming the fat-filled premarginal recess of Eisler. The line of attachment then continues to again reach the lateral orbital rim, just below the level of the Whitnall ligament. Reid et al proposed the existence of a septal extension, from the line of fusion of the orbital septum to the levator aponeurosis, extending caudally to cover the tarsal plate up to the ciliary margin. The septal extension acts as an adjunct to the levator aponeurosis; recognition of this structure may be important to avoid relapse or complications in ptosis repair and blepharoplasty. The orbicularis retaining ligament (also called the orbitomalar ligament or the orbicularis retaining septum) attaches the orbicularis oculi to the inferior orbital rim; it is broader and stronger inferolaterally than centrally. This ligament is a bilaminar membrane separated by a thin layer or fat along the inferior orbital rim and spans circumferentially around the entire orbit. The expanded lateral end of the orbicularis retaining ligament is continuous with the lateral orbital thickening. The orbicularis retaining ligament ends medially with direct connection to the orbicularis oculi muscle at approximately the level of the nasal limbus, above the levator labii superioris. It has been shown to be consistently inferior to the zygomaticofacial nerve and foramen, making it an important surgical landmark. The orbicularis retaining ligament is distinct from the orbital septum, and the two fuse to from the arcus marginalis. The orbital thickening is a fibrous fusion between the orbicularis fascia covering the peripheral part of the orbicularis oculi, and the underlying deep fascia (ie, periosteum and the deep temporalis fascia). The orbital thickening extends across the entire width of the frontal process of zygomatic bone and onto the deep temporal fascia for a variable distance. With age, the retaining ligament becomes distended and thinned, with the changes being greater centrally than laterally. During surgery, the detachment of the orbital thickening and the lateral part of the retaining ligament will completely release the superficial fascia from the orbital rim. The levator palpebra superioris (LPS) arises at the orbital apex from the undersurface of the lesser wing of the sphenoid bone. The levator muscle and superior rectus muscle share a developmental origin and are connected by fibrous attachments. The LPS proceeds anteriorly for 40 mm and ends in an aponeurosis approximately 10 mm behind the orbital septum. The levator complex changes direction from a horizontal to a more vertical direction at the superior transverse ligament (Whitnall ligament). The superior transverse ligament lies near the junction of the muscular and aponeurotic levator and represents an orbital fascial condensation spanning the anterosuperior orbit between the trochlea and the lacrimal gland fascia. Variations in thickness and adherence to the levator complex are evident. Thin fascial attachments lie between the superior transverse ligament and superior orbital rim. The levator aponeurosis spreads laterally and medially to form lateral and medial horns. The medial horn attaches to the posterior lacrimal crest. The lateral horn divides the lacrimal gland into orbital and palpebral lobes before attaching to the lateral retinaculum at the lateral orbital tubercle. The aponeurosis fuses with the orbital septum prior to reaching the level of the superior tarsal plate border. At the inferior edge of this fusion, some aponeurotic fibers descend to insert into the lower third of the anterior surface of the tarsal plate. An anterior extension from this fusion inserts into the pretarsal orbicularis oculi muscle and overlying skin, forming the upper lid skin crease. 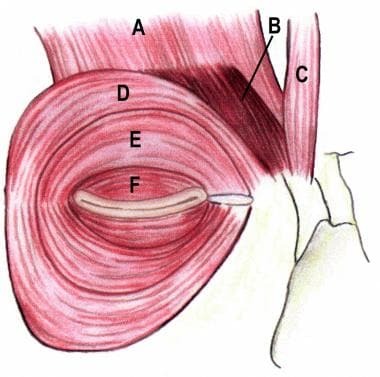 Kakizaki proposed that the levator aponeurosis consists of 2 layers, anterior and posterior, which also contain smooth muscle in their proximal parts. The anterior layer ends in the junctional region with the orbital septum and pulls the preaponeurotic pad of fat in conjunction with the orbital septum and the submuscular fibroadipose tissue. The posterior layer is attached to the anterior inferior one-third of the tarsal plate. It thus regulates the tension of the eyelid and the ordered movement of the lid. Müller muscle is smooth muscle innervated by the sympathetic nervous system. Fibers originate from the undersurface of the levator in the region of the aponeurotic muscle junction, travel inferiorly between the levator aponeurosis and conjunctiva, and insert into the superior margin of the tarsus. With age, fatty infiltration may occur, giving the muscle a yellowish color. Contrary to previous understanding, the Müller muscle may also be involved in thyroid eye disease, by fibrosis and mast cell infiltration. The Müller muscle may function as a large, serial muscle spindle. The stretching of the Müller muscle by the initial eye opening action of the levator may initiate a reflex via the mesencephalic trigeminal nucleus, which subsequently is routed through the ipsilateral or bilateral levator muscle, evoking involuntary tonic contraction to maintain an adequate visual field. The peripheral vascular arcade of the upper eyelid lies adherent to the lower border of the anterior surface of the Müller muscle, just above the upper border of the tarsus, and is apparent during blepharoptosis surgery as a plane of dissection is created between the levator aponeurosis and the Müller muscle. The action is to widen the palpebral fissure with increased sympathetic tone. About 2 mm of ptosis is observed in Horner syndrome. Sympathetically innervated smooth muscle fibers are also noted in the lower eyelid and constitute the inferior tarsal muscle. The lower eyelid retractor is a fascial extension from the terminal muscle fibers and tendon of the inferior rectus muscle, originating as the capsulopalpebral head. As it passes anteriorly from its origin, it splits to envelop the inferior oblique muscle and reunites as the inferior transverse ligament (Lockwood ligament). From there, the fascial tissue passes anterosuperiorly as the capsulopalpebral fascia. The bulk of the capsulopalpebral fascia inserts on the inferior border of the inferior tarsus. Fibers also pass forward, to unite with the Tenon capsule, and to the inferior fornix conjunctiva, through orbital fat to the orbital septum, and forward to the subcutaneous tissues forming the lower eyelid crease. The orbital septum fuses with the capsulopalpebral fascia approximately 5 mm below the inferior tarsal border. The inferior tarsal muscle (Müller muscle) lies just posterior to the fascia and is intimate with its structure. The sympathetically innervated smooth muscle fibers are first noted near the origin of the capsulopalpebral head. The capsulopalpebral head splits into 2 portions to pass around the inferior oblique muscle sheath; the portion beneath the muscle is thin and devoid of smooth muscle, while the portion above is a much thicker fascial layer and contains the smooth muscle fibers. As they continue to pass forward, the smooth muscle fibers do not insert directly onto the inferior tarsal border but into the fascia several millimeters below the tarsal border. The central fat pad is yellow and broad. The central fat pad is recognized by its yellowish color due to a higher level of carotenoids. A portion of the lateral end of this pad surrounds the medial aspect of the lacrimal gland. The lacrimal gland has a firm, pinkish, lobulated structure, in contrast to the soft, yellow intraorbital fat. The lacrimal gland's anterior border is normally just behind the orbital margin, but involutional changes may lead to prolapse anteroinferiorly, which is prominent on external lid examination. Three retroseptal fat pads are associated with the lower eyelid. The medial and central fat pads are separated by the inferior oblique. However, an isthmus of fat generally lies anterior to the muscle belly. The inferior oblique muscle takes a bony origin from a shallow depression on the anteromedial orbital floor, directly posterior to the orbital margin and lateral to the nasolacrimal canal. The inferior oblique muscle courses posterolaterally, passing inferior to the inferior rectus muscle, penetrating the Tenon capsule, and inserting onto the globe near the macula. Its course makes it susceptible to injury during surgical dissection of the surrounding fat pads. The medial and lateral fat pads are separated by the arcuate expansion, a fascial band extending from the capsulopalpebral fascia to the inferolateral orbital rim. Notably, the inferolateral orbital septum inserts 2 mm outside the orbital rim, creating the recess of Eisner, allowing the lateral fat pad to just spill over the orbital rim. The conjunctiva is a smooth, translucent mucous membrane. Palpebral conjunctiva lines the posterior surface of the lids as tarsal conjunctiva (from the mucocutaneous junction of the lid margin to the tarsal plate border) and continues as orbital palpebral conjunctiva into the fornix. Tarsal conjunctiva is adherent to the tarsus, while a submucosal lamina propria underlies orbital palpebral conjunctiva and allows dissection from the vascular Müller muscle. At the depths of the fornices, the conjunctiva reflects anteriorly onto the globe as bulbar conjunctiva. Sensory innervation of the eyelids is subserved by terminal branches of the ophthalmic (cranial nerve [CN] V1) and maxillary (CN V2) divisions of the trigeminal nerve (CN V). Within the superior orbit, the frontal branch of the ophthalmic division of the trigeminal nerve travels anteriorly between the periorbita of the roof and the levator muscle. Midway along the roof, it divides into a larger supraorbital nerve and a smaller supratrochlear nerve. Terminal branches of these nerves supply sensation to the upper eyelid and forehead. The supraorbital nerve exits the orbit through the supraorbital notch or supraorbital foramen. It subserves sensation to the upper eyelid and forehead skin, except for a midline vertical strip, which is supplied by the supratrochlear nerve. The supratrochlear nerve exits the orbit just lateral to the bony origin of the corrugator supercilii muscle, enters this muscle, and divides into its terminal sensory branches. The infratrochlear nerve, a terminal branch of the nasociliary nerve (CN V1), supplies the skin and conjunctiva of the medial canthus, the most medial aspect of the eyelids, and the nasolacrimal sac. The sensory supply of the remaining lower eyelid is provided by the infraorbital nerve (CN V2) and the zygomaticofacial nerve (CN V2). The zygomaticofacial nerve supplies skin to the lateral lower eyelid, while the palpebral branch of the infraorbital nerve supplies the central lower eyelid skin and conjunctiva. Branches of the facial nerve innervate the muscles of facial expression. The frontal and zygomatic branches of CN VII innervate the orbicularis oculi muscle; the frontal branch of CN VII innervates the forehead muscles. The levator palpebra superioris is innervated by the superior branch of the oculomotor nerve, entering the muscle from its inferior surface in its posterior third. Müller muscle (and the inferior tarsal muscle) requires sympathetic innervation. Postganglionic sympathetic fibers arise from the superior cervical ganglion and travel superiorly in the neck as a plexus with the internal carotid artery. The fibers take an intracranial course to the cavernous sinus, where they travel through the superior orbital fissure into the orbit via CN branches. Within the orbit, the exact pathways for sympathetic innervation of the superior and inferior tarsal muscles is unknown, but some evidence suggests that sympathetic fibers travel with the extraocular muscle motor nerves before termination on the target muscles. The internal and external carotid arteries contribute to lid arterial supply. The internal carotid arterial supply is from the terminal branches of the ophthalmic artery medially (giving supraorbital, supratrochlear, and dorsal nasal branches) and the lacrimal artery laterally. In the medial upper eyelid, 2 medial palpebral arteries arise from the ophthalmic artery as the superior and inferior marginal vessels and pass laterally—one to supply the upper lid and one to supply the lower lid. The inferior marginal vessel is actually a branch of the superior marginal vessel and passes deep to the MCT and canaliculi for about 10 mm before passing into the lower eyelid proper. These marginal vessels pass horizontally as marginal arcades. The marginal arcades lie on the anterior tarsal surface approximately 4 mm and 2 mm from the upper and lower eyelid margin, respectively. In the upper lid, a peripheral arcade arises from the marginal arcade and lies on the anterior surface of the Müller muscle, just above the superior tarsal border, where it is susceptible to injury during blepharoptosis surgery. In the lower lid, no (or only a rudimentary) peripheral arcade exists. Laterally, the lacrimal artery pierces the orbital septum to give 2 lateral palpebral arteries. They pass medially, one to the upper eyelid and one to the lower eyelid, and anastomose with the marginal arcades. The external carotid artery contributes via branches of the facial artery, the superficial temporal artery, and the infraorbital artery. The facial artery provides the angular artery, which passes to the medial canthal region, anastomosing with the dorsal nasal artery. The superficial temporal artery supplies eyelid anastomoses via the transverse facial and zygomatic branches. The infraorbital artery exits the infraorbital foramen as a terminal branch of the maxillary artery, anastomosing with vessels of the lower eyelid. The eyelids and conjunctiva have a rich lymphatic drainage. The drainage of most of the upper lid and the lateral half of the lower lid is to the preauricular lymph nodes. The medial portion of the upper lid and the medial half of the lower lid drain into the submandibular nodes by way of vessels that follow the angular and facial vessels. Matsuo T, Takeda Y, Ohtsuka A. Stereoscopic three-dimensional images of an anatomical dissection of the eyeball and orbit for educational purposes. Acta Med Okayama. 2013. 67(2):87-91. [Medline]. Knize DM. The superficial lateral canthal tendon: anatomic study and clinical application to lateral canthopexy. Plast Reconstr Surg. 2002 Mar. 109(3):1149-57; discussion 1158-63. [Medline]. Flowers RS, Nassif JM, Rubin PA, et al. A key to canthopexy: the tarsal strap. A fresh cadaveric study. Plast Reconstr Surg. 2005 Nov. 116(6):1752-8; discussion 1759-60. [Medline]. Reid RR, Said HK, Yu M, et al. Revisiting upper eyelid anatomy: introduction of the septal extension. Plast Reconstr Surg. 2006 Jan. 117(1):65-6; discussion 71-2. [Medline]. Muzaffar AR, Mendelson BC, Adams WP Jr. Surgical anatomy of the ligamentous attachments of the lower lid and lateral canthus. Plast Reconstr Surg. 2002. 110:873-884. Kakizaki H, Zako M, Nakano T, et al. 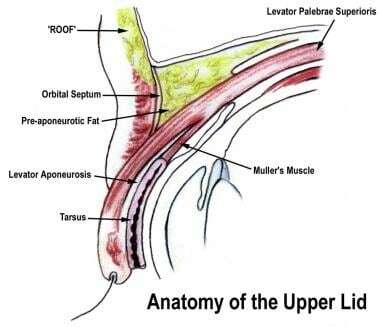 The levator aponeurosis consists of two layers that include smooth muscle. Ophthal Plast Reconstr Surg. 2005 Jul. 21(4):281-4. [Medline]. Kakizaki H, Jinsong Z, Zako M, et al. Microscopic anatomy of Asian lower eyelids. Ophthal Plast Reconstr Surg. 2006 Nov-Dec. 22(6):430-3. [Medline]. Kakizaki H, Malhotra R, Selva D. Upper Eyelid anatomy: an update. Ann Plast Surg. 2009. 63(3):336-43. Sires BS, Saari JC, Garwin GG, Hurst JS, van Kuijk FJGM. The Color Difference in Orbital Fat. Arch Ophtahlmol. 2001. 119:868-71. Lowe JB 3rd, Cohen M, Hunter DA, et al. Analysis of the nerve branches to the orbicularis oculi muscle of the lower eyelid in fresh cadavers. Plast Reconstr Surg. 2005 Nov. 116(6):1743-9; discussion 1750-1. [Medline].